In the early 1990s girls decorated their form rooms early in December, but by the time I left the school in 2013 it had been restricted to the last week of term only. Some years a competition was held between forms for the best designed form room. Often girls had 'themes' for their rooms. Any rooms with motion sensors couldn't have streamers or balloons that might move with the heating drafts. One year the site staff had to come out to investigate an alarm that had been set off in the middle oif the night when the blue-tac holding a streamer gave way! Because of 'health and safety regulations' any electrical items such as Christmas lighting for trees had to be PAT tested and passed by the site staff. Problems caused for the cleaning staff by girls not cleaning off all decorations from their form rooms, or the decorations ruining the paint on the walls or doors, or stripping polish from floors, or staining the carpets, led to fake snow spray, sellotape and glitter spray being forbidden. In the 1990s the main school hall was decorated by Mrs. Brierley and the senior Art students with enormous posters and fairy lights. A lot of work went into it. The decoration was used as a backdrop for Punch and Carols and for the Christmas Parents' Guild Dance (a WGHS version of Hogwart's Ball -that was unfortunately stopped in the early 1990s because students did not want to come in evening dresses or to make their male escorts come in a suit....). After Mrs. Brierley retired the Hall decoration was a simplified affair (the photo is from about 2012). If anyone has photos of the wonderful posters in the hall I would love to share them! The entrance hall had a large real Christmas tree and fairy lights around the edge of the wood panelling. 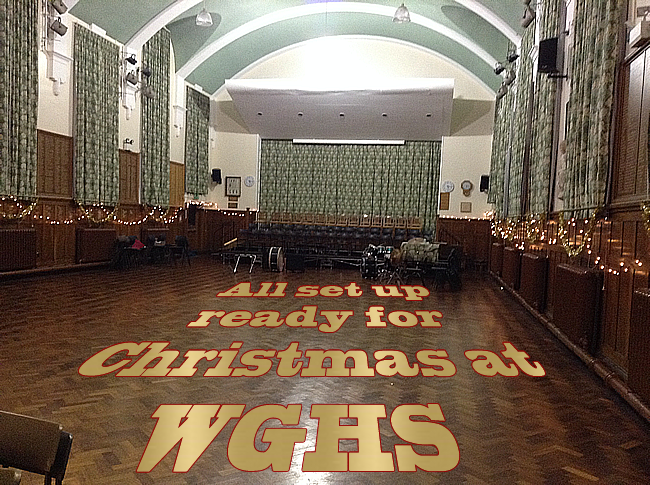 The hall was indeed decked with boughs of holly from the school grounds. Festive art work decked the walls and the kitchen staff all enthusiastically decorated the dining room with mini Christmas trees and streamers etc (although when motion sensors came into use that was restricted a bit!). The kitchen staff wore festive clothing, santa hats, antlers, flashing earings and badges etc. and played carols and Christmas songs as background music when the girls dined.